Business agility be defined as a company's ability to respond to changes in business conditions quickly enough to benefit from them. To support business agility, IT managers generally want to be able to execute projects quickly and efficiently, but circumstances can often conspire against them. Virtualization now offers managers the ability to execute the deployment and scaling of IT systems quickly to support agile business initiatives. 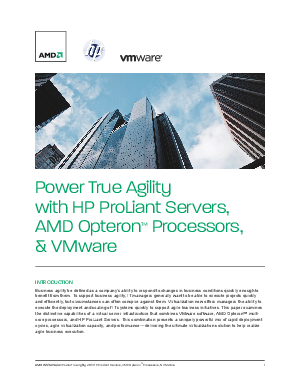 This paper examines the distinctive capabilities of a virtual server infrastructure that combines VMware software, AMD Opteron multicore processors, and HP ProLiant Servers. This combination presents a uniquely powerful mix of rapid deployment cycles, agile virtualization capacity, and performance-delivering the ultimate virtualization solution to help realize agile business execution.